Having oily skin can lead to an unsightly reflective shine and painful acne breakouts. To some extent, you can't control how much oil your skin produces because your skin type is affected by your genes. Though your skin type may always be on the oily end of the spectrum, oily skin doesn't have to be a lifelong plague. Changing some skincare methods can help you keep the oil production under control for good, according to MayoClinic.com. Wash with an over-the-counter medicated acne cleanser twice per day. Find one that contains benzoyl peroxide, alpha hydroxy acid or salicylic acid as its active ingredient, as this helps break down excess oil. 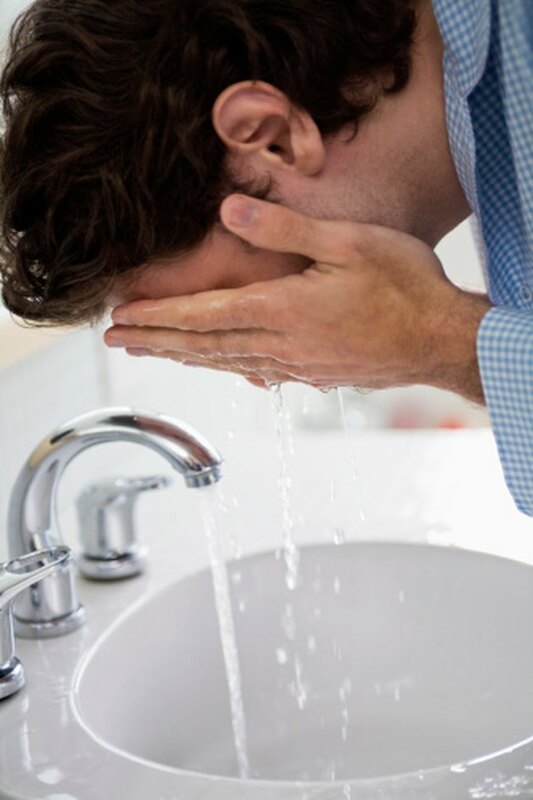 Wash your face once in the morning and once before bedtime. Even if your skin tends to be oily, washing it too often can cause it to dry out and overcompensate by producing even more oil. Apply an alcohol-free toner. Using a toner that contains alcohol could cause your skin to become too dry, but toners that contain ingredients such as witch hazel will help dry up excess oil while ensuring that your face remains moisturized. Apply a mineral-based sun block instead of a morning moisturizer. You don't need a traditional facial moisturizer if your skin is already doing a good job of keeping itself moisturized. However, using about 1 tsp. of a mineral-based block, such as micronized zinc, will help absorb oil and protect your skin from sun damage. This will have a double effect because sun-damaged skin tends to produce more oil. Use only oil-free cosmetics and toiletries. Anything you put on your skin should be labeled "non-acnegenic" or "non-comedogenic," meaning oil-free and unlikely to cause further oily skin problems, according to the American Academy of Dermatology. Using mineral powder cosmetics, as opposed to creamy products, will also help absorb some oil. Blot your skin during the day. Skin-blotting papers are created to absorb facial oil and reduce shine throughout the day without smudging your make-up. However, keep in mind that these papers are more of a temporary fix than a long-term solution. Over-the-counter oil-reducing products come in a variety of strengths. For example, salicylic acid often comes in strengths of 2.5 percent, 5 percent and 10 percent. To reduce risk of skin irritation, begin with the lowest concentration of the active ingredient that you can find on the shelves. If you don’t notice any improvement within a couple of weeks and the lowest strength caused no irritation, bump up to the next level. Consult a doctor or dermatologist if you don’t see any improvement in your skin within 6 to 8 weeks of changing your skincare routine. You may need a stronger solution, which would most likely come in the form of a prescription. Is There a Natural Way to Reduce Overactive Sebum Glands?